Here follows a list of known engagements held during the reign of the last three Carolingian rulers of East Francia. Descriptions of the battles do not give numbers, tactics or deployments and at best name only the principle leaders. We do know armies were not very large as logistical methods could not sustain armies in the field for long periods. I have a series of scenarios based on a number of historical events listed below and using DBA 3.0, many of these will be fought between unequal sized forces over unusual terrain setups making them unique. These will follow soon. 825 Louis II campaigns against the Wends and Sorbs. 832 (2nd Civil War) Louis leads an army of Slavs to invade Alemannia. Louis the Pious disinherits Louis but is captured and deposed by his sons. 839 (3rd Civil War) Louis again invades Alemannia. By force of arms, peace was resolved between father and son. 840 Louis the Pious dies. 854 Louis invades Aquitaine to seize the crown from Charles the Bald, but turned back at Limoges. 858 Louis the Younger campaigned against the Abodrites to the east and again in 862. 863 Charles and brother Carloman revolt against their father Louis II. 876 Louis on the 8th October defeated Charles’ much larger host of West Francia at Andernach. 876 Louis II sent Charles and then Carloman with armies containing Italian forces under Berengar of Friuli, their cousin, to possess the Italian kingdom. 880 Charles joined Louis III and Carloman, joint kings of West Francia, in besieging Boso of Provence in Vienne from August to September but they failed to dislodge him. 880 Saxon army, led by Duke Bruno, brother-in-law to the king, was defeated at Hamburg. 880 Resettlement of the Great Danish Army to the Low Countries. 882 to 884, the Wilhelminer War in Marcha Orientalis (later Austria). 882 Charles campaigned against the Danes to reunite the whole of East Frankish realm. Besieged at Asselt, the Viking chiefs Godrey and Sigfred accepted Christianity and became vassals of Charles. 887 General rebellion by Arnulf led his Bavarians and Slav allies against Charles. 888 Death of Charles, last Carolingian ruler of East Francia. This list is by no means complete, but will be revised as I encounter more information. 1 x archers (2Ps) or levies (7Hd). Simulating the early military period of Louis the German (AD 840 – 876) the above can use some minor modification for simulating historical scenarios. Firstly, I have not found any references to Gascon or Basque troops serving with the Eastern Empire. Light troops were certainly supplied by various Slav allies and there are even references of Magyar light horse serving as mercenaries, not unlike the early Huns serving as mercenaries ahead of Attila's campaigns. So optional troop types remain, but are of a different nationality. Louis began his regal career as Duke of Bavaria (817). Reflecting on the animosity between brothers I would be unsure about Bavarian milites serving among West Frankish armies after this period. Taking this a further step, would Louis’ initial command consist solely of Bavarian milites, levy and archers? Verbruggen does make reference to the Bavarian knights dismounting to fight but mentions in the next sentence they were ready to mount and pursue a fleeing foe. Further, under the section on tactics, a good commander held mounted troops as part of his reserve and stationed himself with them. In 840, Louis became ruler of East Francia and with it came the military resources of the empire. We do know the East Franks followed the practices set down by Carolingian capitulary law regarding equipment, terms of service, etc. From my reading so far, the milites were prepared to campaign outside their duchies. This is better documented during reign of Henry the Fowler. We can imagine lesser nobles raising their levies to deal with local incursions. If the situation required the milites, these would be assembled to be led by their ruling noble or bishop. This process becomes a bit more complex when we consider the family rivalries affecting the recruitment of armed troops, but that makes this fun. Common terms of the period. I think the reader may find the following description of commonly used terms of the period. Descriptions were complied from various Wiki sources. *The stem duchies (German: Stammesherzogtümer, from Stamm, literally "tribe") were essentially the domains of the old Germanic tribes of the area associated with the Francia, especially the Eastern part upon the 843 partition by the Treaty of Verdun, in the Early Middle Ages. The tribes that became stem duchies were originally the Alemanni, the Thuringii, the Saxons, the Franks, the Burgundians, and the Rugii. The tribes were part of the Völkerwanderung (or Germanic migrations) of the 5th century. In 443 and 458, the Burgundians moved to settle in the Kingdom of Burgundy; the area they had formerly occupied in Germania was then occupied by the Franks. The Franks were a fusion of West Germanic tribes whose leaders had long been aligned with Rome. The Rugii were destroyed in the wars over Italy in the 5th and 6th centuries, and a new confederation of Germanic peoples formed in their place: the Bavarii. All these tribes in Germania were eventually subjugated by the Franks; the Alemanni fell in 496 and 505, the Thuringii in 531, the Bavarians at some point after 553, and then finally the Saxons by 804 in a protracted campaign by Charlemagne himself. **Marches North and south of Bohemia, the Germans headed east, founding a series of border counties or Marches, ruled by margraves (mark-graf). 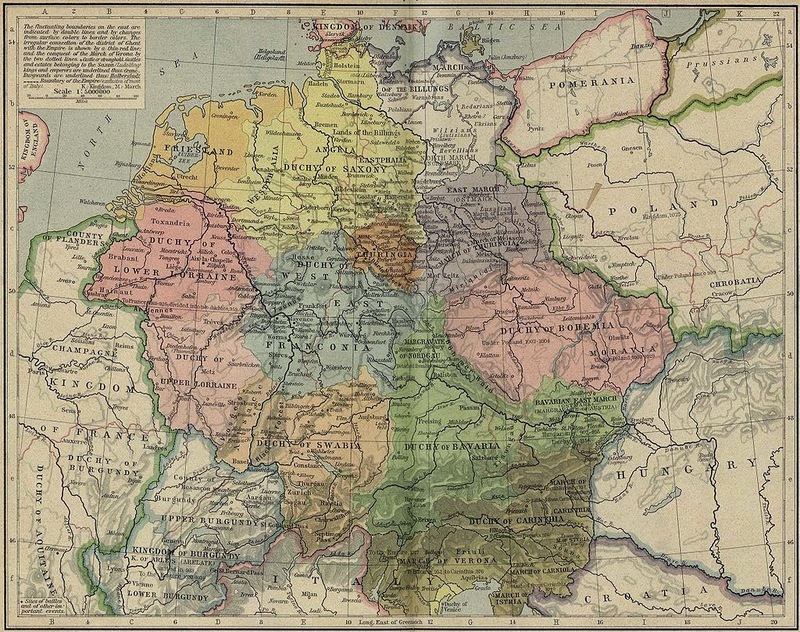 To the north these started with the Margraviate of Meissen and the March of Lusatia, and to their north the Northern March, which became later the Margraviate of Brandenburg (the heart of the later Kingdom of Prussia). Last in the north was originally the Billung March, which eventually became the duchies of Holstein, Lauenburg, Mecklenburg, and Hither Pomerania. In the south, there were the marches of Carniola, Carinthia, Styria, and Austria (later Österreich ("eastern realm") or Duchy of Austria). ***Herzog Herzog is not related to Herz ('heart'), but derives from German(ic) He(e)r ('army') and zog (ziehen) (English: 'to pull, drag', also in die Schlacht ziehen "to go into battle"), a military leader. Thus Herzog was a title borne by Germanic warriors who exercised military authority over a tribe by general acclaim among its members or warriors, especially in the stem duchies. During the medieval era, some of the most powerful vassals whose territories lay within the boundaries of the Holy Roman Empire took or were granted the title of Herzog by the Emperor. Several dynasties, such as the Habsburgs of Austria, Hohenzollerns of Prussia, Welfs of Hanover, Wettins of Saxony, Wittelsbachs of Bavaria and the House of Württemberg, held the Herzogswürde (dukedom) before becoming kings. ****Ministeriales Ministerialis; a post-classical Latin word, meaning originally servitor, agent, in a broad range of senses. These were people raised up from serfdom to be placed in positions of power and responsibility. Ministeriale(n) and Dienstmann, came to describe those unfree nobles who made up a large majority of what could be described as the German knighthood during that time. What began as an irregular arrangement of workers with a wide variety of duties and restrictions rose in status and wealth to become the power brokers of an empire. The ministeriales were not legally free people, but held social rank. Legally, their liege lord determined who they could or could not marry, and they were not able to transfer their lords' properties to heirs or spouses. They were, however, considered members of the nobility since that was a social designation, not a legal one. 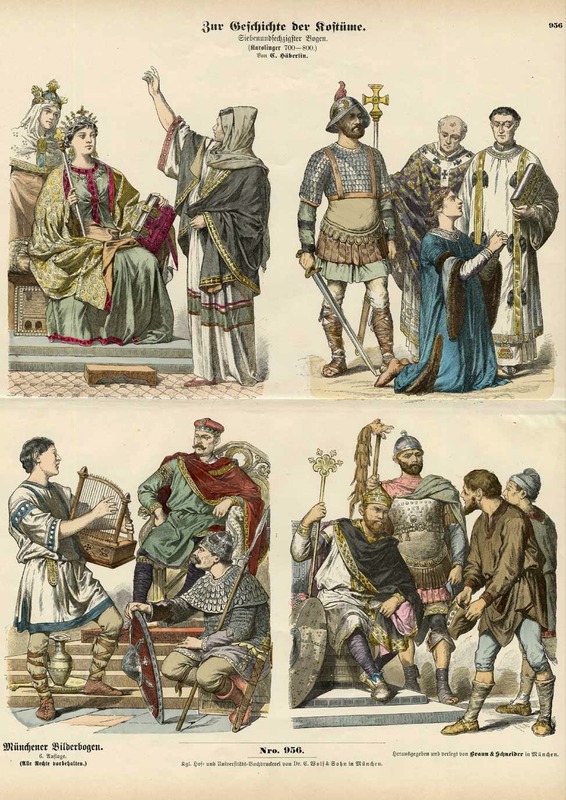 Ministeriales were trained knights, held military responsibilities and surrounded themselves with the trappings of knighthood, and so were accepted as noblemen. Both women and men held the ministerial status, and the laws on ministeriales made no distinction between the sexes in how they were treated. Abbot Adalard of Corbie (d. 826) was Emperor Charlemagne's chief adviser, and described the running of the government in his work De ordine palatii. There he praises the great merits of his imperial staff, made up of household servii proprii (serfs) who were the first ministerials authoritatively recorded. It was Emperor Conrad II (990-1039) who first referred to ministerials as a distinct class. He had them organized into a staff of officials and administrators. In documents they are referred to as ministerialis vir, or ministerial men. Ministeriales as household servants were entrusted with special responsibilities by their overlords, such as the management of a farm, administration of finances (chancery) or of various possessions. Kings placed military requirements upon their princes, who in turn, placed requirements upon their vassals. The free nobles under a prince may have a bond of vassalage that let them get out of serving, so kings, princes, bishops and archbishops were able to recruit unfree persons into military service. There were two sorts of ministerials: casati, who administered lands and estates for a liege and were paid from the proceeds of the land and non-casati, who held administrative and military positions but were paid in either a fixed amount of coin or by a portion of the proceeds of mills, road or bridge tolls, or ferry fees or port taxes. When a campaign (profectio) of the king is announced to the bishop (of Metz, in this case) the bishop will send an official to the abbot, and the abbot will assemble his ministeriales. He will inform them of the campaign, and they will assemble the following men and equipment...: one wagon with six cows and six men; one packhorse with saddle and equipment and two men, the leader and the driver...If the king moves the army to Italy, all the peasant farms shall contribute for that purpose their usual taxes (that is, probably an entire annual rent as an extraordinary tax). But if the army moves against Saxony, Flanders or elsewhere on this side of the Alps, only half that amount will be given. From these additional taxes the wagons and pack animals will be loaded with rations and other items necessary for the journey. In Bamberg the Carolingian method of providing for a campaign remained in effect. Ministeriales were grouped into threes; one went on campaign while the other two were responsible for equipping and victualing him. This ensured that those who were sent to war were prepared for war. this also shows that a military obligation didn't necessarily mean riding off with the army. *****Heerbann The Heerbann (also formerly Heermannie, Mid. Latin: Heribannus, French: Arrière-ban), in the Imperial Military Constitution (Reichsheeresverfassung) of the Holy Roman Empire, was the call to all free landowners capable of bearing arms to participate in a military campaign, i.e. in an imperial war (Reichskreig). However, as the feudal system in the Holy Roman Empire developed in the Early Middle Ages, the Heerbann became superfluous as a means of raising armies and increasingly fell into disuse after the death of Charlemagne. The Heerbann was particularly imposing for poorer landowners, several of whom had to equip a knight for war (one for every 3 hides), so they would attempt to withdraw themselves from his service and place themselves in the service of and under the protection of a more powerful lord, who would assist them in providing the necessary military equipment or even stand them down from military service entirely. 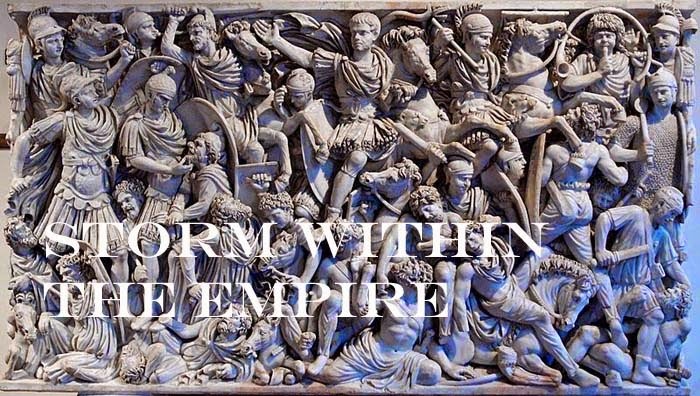 Towards the end of the 10th century, this led to the reshaping of the entire military constitution. The armies of the king now no longer consisted of all free knights, but came from powerful imperial officials or vassals and their entourages; and those who rendered no military service had to pay a campaign tax (Heersteuer). The necessary organisation of the Heerbann, needed thanks to constant campaigning by Charlemagne, was divided by him into seven levels or "shields of knighthood", the so-called Heerschilde. The campaigns, which were fought with the aid of the Heerbann, were called Heerfahrten, the participation of the vassals was known as Heeresfolge. By the time of the Crusades, when the feudal system had reached its height, the Heerbann had almost totally disappeared in all European states. ******Heerschild The Heerschild (Latin: clipeus militaris), also called the shield of knighthood, in the Early Middle Ages was the right to raise a feudal levy of troops. The call to do so was the Heerbann. The resulting importance of a system of military ranks, based on the ability to provide men for a campaign, became modified in the law books published in the 13th century. It finally ended up as being an important part of the structure of medieval society, as captured in the feudal law element of the Sachsenspiegel by Eike von Repgow. The Sachsenspiegel, the Saxon law book, portrays the society of the medieval empire as divided into seven feudal military levels or Heerschilde (lit. : "army shields"). This Heerschildordnung was a scale determining a nobleman's status and was not based on military criteria. The first Heerschild was the king or emperor as the supreme overlord. This was followed by the second "shield", formed by the ecclesiastical princes - the bishops and abbots - of the empire. The third level comprised the secular or lay princes, who, in turn, sat above the "free lords" (freie Herren), i.e. nobles who were not princes, of the fourth stratum. The fifth and sixth Heerschilde were formed by freeman, whether eligible for jury service (schöffenbar) or not, in other words commoners who were able to act as magistrates (5th level) or not (6th level). As to the seventh level, the Sachsenspiegel remains vague, both in terms its composition, as well as whether it was in any real sense a Heerschild. Based on this division of society, the Sachsenspiegel then dealt with the feudal law rights and obligations of each Heerschild.